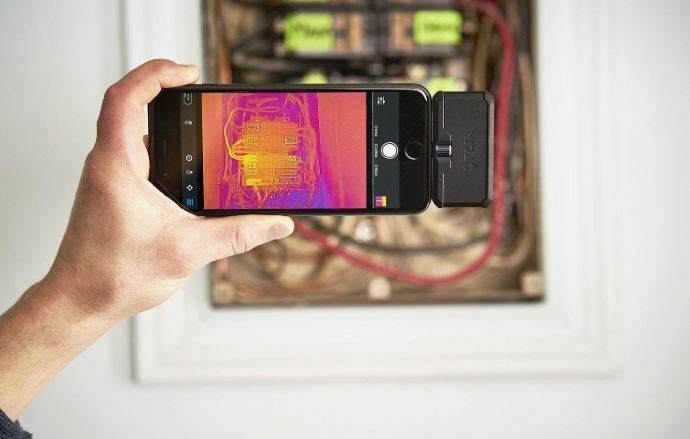 The FLIR ONE Pro is for homeowners, hobbyists and pros who want a powerful smartphone thermal camera with high resolution, good image quality and a wide temperature range. The ONE Pro is compatible with most smartphones including iPhones, USB-C Android phones and Micro USB android devices. 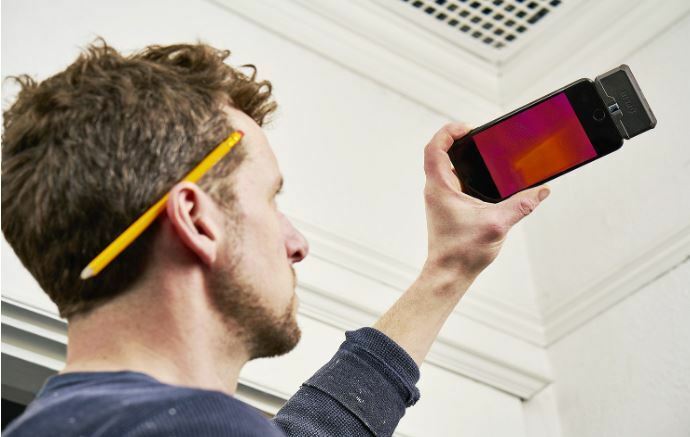 In terms of thermal imaging, the FLIR ONE Pro is good enough for home DIY projects and basic professional work. The camera’s resolution is decent, the temperature range is ultra-wide and the camera’s rugged design makes it safe to use both at home and job sites. Our only complaint is that the camera’s software and phone app are buggy. Many customers have reported issues with the battery indicator, camera auto-detect and other app features. System inspections – HVAC, cooling systems, engines, electrical systems etc. For a smartphone thermal camera, the FLIR ONE Pro has an impressively high resolution. The 19,200-pixel thermal resolution (160 x 120) produces highly detailed images even from a distance. You can detect a person or an animal from as far as 130 feet, making the ONE Pro ideal or both short-range and long-range applications. The camera also comes with FLIR’s proprietary VividIR™ technology that enhances thermal resolution to add more detail and clarity to your images. Whether you are inspecting some factory equipment or looking for pests hiding in your walls, the FLIR ONE Pro is great. Something else we did not expect from a thermal camera of its size is the extra-wide temperature range. With a range of 4°F to 752°F, it beats even some more expensive thermal cameras. The wide temperature range allows you to inspect much hotter objects than what most thermal cameras would. For instance, if you have a bakery or restaurant you can use the ONE Pro to regularly inspect your hot oven and make sure the heat is well balanced and it’s not escaping outside. The FLIR ONE Pro overlays images from a thermal and a visual camera to add more detail to the final image. Instead of just seeing hot and cold spots, you can actually see where these spots are. This makes it easier to spot where a problem is. The ONE Pro works with most modern smartphones. There are three versions of the camera for iOS devices, Micro USB Android devices and USB-C Android devices. So whatever kind of smartphone you have, you should be able to use the One Pro. Note that for iOS devices, it is compatible only from iPhone 5. For Android devices, compatibility begins with Android 5.0 Lollipop. A common question people ask is whether the FLIR ONE Pro will work with the phone case on. Yes, it can. FLIR has introduced a new feature called OneFit™. The USB-C or Micro USB connector can be lengthened up to an additional 4mm. 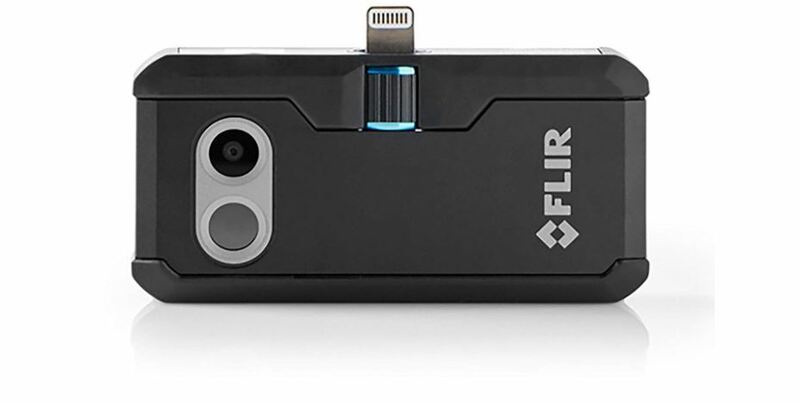 Even if you are using a thick protective case on your phone, the FLIR ONE Pro will likely still work. That’s great if you are concerned about dropping your phone as you work. The FLIR ONE Pro doesn’t have an impressive rating on Amazon. But most of the complaints are not about performance – many users say the image quality is excellent–but rather the problematic app and software. Some of the issues reported include some phones not automatically recognizing the camera, long camera freeze when processing an image and problems with certain features like spot meter. There are also problems with the battery. Even when the battery is full, the indicator says it is only 85% full. This doesn’t affect performance; it’s just annoying. The USB connector acts both as a connection and support point. As a result, it doesn’t provide the most secure connection between the camera and your smartphone. The camera can easily fall off and get damaged. The FLIR ONE Pro has its own battery that drains quickly. You only get about 30-40 minutes out of it before you need to recharge. It also drains your smartphone’s battery fast. But this is understandable considering the high-resolution images and power-intensive features like MSX. Luckily, the camera recharges fairly quickly – in about 40 minutes. If you are planning to use this for an extended period at a job site, carry a power bank with you. 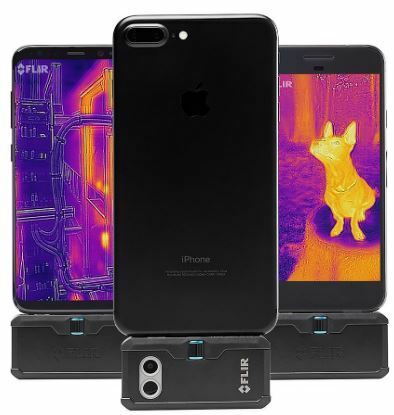 The FLIR ONE Pro is one of the most powerful smartphone thermal cameras. If you are looking for a capable but affordable smartphone camera for home projects or basic professional work, we highly recommend it.